If you are searching for a professional plumbing contractor that you can depend on with all your residential plumbing needs then check out our skilled Holly Springs Plumbers. We specialize in all plumbing repairs and installations that include new installations, system replacement, or repairs both inside your residential property or out in the yard. With you Guaranteed Plumbing you get the advantage of hiring an experienced company. Since 2007 we have built a name as a trusted water systems company. We offer honest, superior client service. We sell top quality products from manufacturers that you know and love. We know that your time and money are extremely valuable. We can help with both. 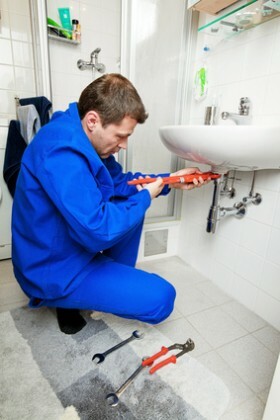 Our plumbing repairs and product installations are low-cost and fast. In many cases we can provide same-day service within a few hours so that you can return to normal routine. Plumbing system installation can be a difficult task. With Guaranteed Plumbing we make plumbing installation simple. Our experienced Holly Springs Plumber will visit your home, make a quick assessment your needs, and then give you a complete estimate. Our Holly Springs Plumber can help you find a well-built, designer system that you are sure to enjoy for years to come. We install all types of plumbing products. Clogged drain problems often necessitate the expertise of a plumbing professional. Surface clogs are generally manageable. Deep blockage caused by different substances, sewage backups, or roots, however, will need to be handled by a company that has both the experience and equipment to handle the toughest jobs. Our Holly Springs Plumber can handle most jobs in an efficient manner and within a day. We will not only clean out the junk, but also completely clean and treat your pipes and restore them back to original condition. When we complete the job you will notice a remarkable difference in the flow of your water once again. Homeowners in the Holly Springs, NC area commonly use water pumps as a central component of their plumbing system. This is why Guaranteed Plumbing provides water pump repair and installation. Once your water breaks down, you need to be able to depend on a company that can fix or replace it fast. We can fix specific components in your water pump, replace them or install a new pump entirely. This includes everything from the wiring, to the pipes, motor and several other parts. We will get your entire water pump system running at peak performance once again. If you are looking for a Holly Springs Plumber then please call 919-PLUMBER (919-758-6237) or complete our online request form. "Guaranteed Plumbing did a great plumbing service. I had a toilet that would not flush, these guys come [...]"
"I don't usually leave reviews. But Guaranteed Plumbing did such a great plumbing repair, I had to leave [...]"
"Our water heater began leaking on a Wednesday before a coming up Friday holiday; finding a plumber this [...]"